What is Driver.Upclk.com on my credit card statement? How To Install Driver Restore? How To Remove Driver Restore Pop Ups? Are you concerned about your online credit card transaction? Is it haunting to purchase products online using credit cards? What if the website offers a secure payment gateway so that the users enjoy safe and hassle free experiences. Driver.Upclk.com offers a similar environment to the users who wish to purchase Driver Restore from the official website. In case your credit card statement has Driver.Upclk.com on it, this signifies that a product has been purchased using the self-service online billing portal. This platform ensures that users follow a simple and easy step-by-step procedure for online payment using their credit cards. Following the payment procedure, a receipt is generated that is mailed to the registered email address to confirm the user for a successful payment and placement of the order. Preventive measures have been adopted to safeguard the users from frauds, identity theft and other related concerns. Other than safe and secure online credit card transactions, Driver.Upclk.com provides user-friendly features too. A user can check their credit card charge through the Purchase Finder button on the website that offers the complete details regarding the previous and current orders. The website provides 24/7 customer service for further assistance. Also, if the user is dissatisfied with the results of the software program, they can request a refund. How to Update Drivers in Windows 8 Manually? How To Update Xbox 360 Controller Drivers For Windows 10? How to Update Drivers in Windows 8? How To Fix “Start Menu Not Working in Windows 10” Issue? How To Update Canon Printer Drivers For Windows 10? How to Update Drivers in Windows 8, 8.1 Manually? How To Update AMD Graphics Driver for Windows 10? How To Fix & Update NVIDIA Drivers in Windows 10? How To Fix Blue Screen Of Death (BSOD) Errors In Windows 10? How To Update Drivers In Windows 10 Manually? How To Fix Windows 10 Sleep Mode Problems Easily? Note: Individual drivers may be available on manufacturer websites at no charge. 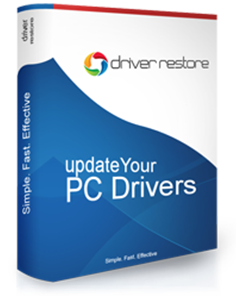 Driver Restore is a driver updater tool that will scan your computer for suitable drivers and provide them in an easy, convenient method. Driver Restore registration is $29.95 USD for 1-year subscription. Driver Restore provides advanced scanning of your computer system. After a system scan has been performed all users will be provided the option to update out-of-date or missing drivers. Updating drivers is provided at a charge while scanning is provided at an unlimited basis. 2019 © Driver Restore. All Rights Reserved.